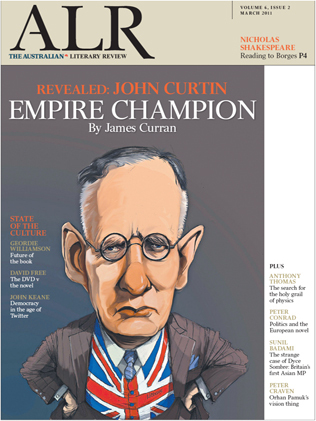 Just a quick reminder that being the first Wednesday of the month, today is Australian Literary Review day. As usual some of the highlights are online, including Nicholas Shakespeare on Borges, ALR Editor Luke Slattery on Belknap’s voluminous The Classical Tradition and Peter Conrad on Antonio Tabucchi’s Pereira Maintains, but the print edition also features long pieces by Geordie Williamson on the future of the book, David Free on the rise and rise of television and Anthony W. Thomas on the search for a Theory of Everything. If you’d like to know more you can check out Luke Slattery’s editorial and the full contents on The Australian’s website, or you can grab a copy for free with today’s Australian. A story on the future of the book not available online?